Insurers would pull out, leaving 5 percent of the country with no access to exchange insurance. Premiums would increase 20 percent in the first year. The federal deficit would increase by $194 billion through 2026. The number of uninsured people would increase slightly in 2018 but then start moving slightly lower in 2020. The big takeaway is the deficit estimate. Paying premium subsidies based on income actually saves the country money. CBO adds that President Trump’s CSR threats alone have already driven premiums up since insurers are required to request approval for their 2018 prices now. 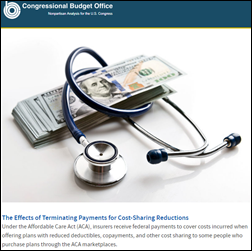 The House of Representatives sued over the ACA’s cost-sharing reductions in 2014, arguing that the payments are illegal since Congress never appropriated the money to fund them. That case remains open. 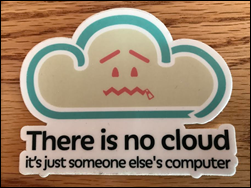 From Keelhauler: “Re: cloud computing. Thought you would enjoy this.” I did, thanks. From Surprise! : “Re: Allscripts. Layoffs today of around 60 worldwide. Some senior people had their positions eliminated. Pretty eventful couple of weeks with the Paragon and NantHealth stuff.” Unverified, but reported by several readers. I reached out to the company’s media contact, who responded, “Allscripts does not discuss rumors or speculation,” which leaves the rest of us to do so without its participation. From Life’s Changing the Ocean Floor: “Re: [health IT site name omitted]. Seems to be dead.” Sure does. Googling turns up no user outrage or fond reminiscing, which suggests that its demise was not untimely. From Pacifico: “Re: Caradigm. LinkedIn shows that several top execs, salespeople, and security team members have left. GE is taking over, cutting headcount and leveraging shared services.” Unverified. I compared the company’s September 2016 leadership page to the current version – the 13 executives are now down to seven, of whom two are new. From Gaslighter: “Re: market share by hospital size. Were those numbers for US hospitals only? Wondering since Meditech has a significant presence in Canada.” Blain Newton of HIMSS Analytics, who provided the count, says the numbers cover only domestic hospitals. From Supine on the Sand: “Re: market share by hospital size. The most meaningful stat is the 500+ bed hospitals since they often take smaller hospitals with them when they choose a vendor, which is why Meditech and Siemens (Cerner) have lost hospitals. Number of beds is most important since it equates better to the number of people – particularly doctors – who use the systems. Meditech is in big trouble because it has no ambulatory presence and Cerner, too takes a hit with ambulatory. Epic is much stronger than Cerner because of its 500+bed dominance and its ambulatory market share. I would love to see market size by beds and by ambulatory doctor count.” I mentioned your interest to Blain and he’s going to analyze EHR vendors by total beds and total physicians, so watch for that. I think Meditech can maintain its relevance for those hospitals that can’t manage the complexity or afford the cost of Epic or Cerner, but I agree that Meditech waited too long to conclude that the offering of partner LSS – which Meditech later bought – wasn’t the integrated ambulatory answer many of its clients and prospects were looking for. All three companies have common traits: they offer single-platform products for nearly every hospital service, they rarely acquire companies (“never” in the case of Epic), and they run on a single database. Those characteristics seem obviously desirable with 20-20 hindsight, but were lost on now-lagging competitors who were busily milking their cash cows, buying and nameplate-integrating anything that moved, and waltzing with Wall Street. From EclipsysGal: “Re: Chad Eckes. Glad to see an IT leader move into the CEO role.” Chad takes the CEO role at Pinnacle Dermatology, a private equity-backed dermatology practice in the Midwest that hopes to expand to 100 locations. He has served time as CIO of Cancer Treatment Centers of America and EVP/CFO of Wake Forest Baptist Medical Center (NC). From Vaporware? : “Re: MHS Genesis pilot sites. I found this testimony from March that says interoperability at Fairchild is through the legacy JLV portal via logging into AHLTA. Future plans include moving the legacy portal into Genesis. Fair to take that as a ‘no’ on CommonWell?” I’ll invite knowledgeable readers to chime in since I don’t know much about the DoD and the planned interoperability with the VA once they’re both on Cerner. It may be that workarounds are necessary until Genesis is live at all DoD facilities. From Eco Chambers: “Re: nonsensical terminology. I submit ‘ecosystem’ or ‘hyper-convergence.’ Where does this stuff come from?” I suspect someone (probably folks aspiring for cleverness in their books or articles) spends a lot of time coming up with words they hope will spread virally. Unfortunately, that sometimes happens, replacing perfectly serviceable and accepted words with cute new ones that only a marketer could love. 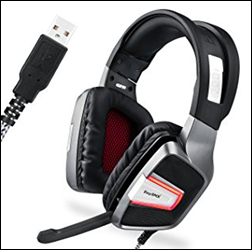 I thought my old Plantronics USB headset was failing since my new laptop wouldn’t recognize it (it wasn’t failing, as it turned out – I fixed the problem by deleting and reinstalling the latest version of the motherboard’s audio driver). I wanted a more comfortable headset since I often listen to music for hours while writing HIStalk and remembered that the best one I’ve owned was a gamer version. My solution: the fantastic EasySMX PS4 for $18.99 (for some reason, it’s gone up to $28.99 since last week). The driver-free headset’s deep ear cushions eliminate room noise while pumping out impressive bass from its 40mm driver with a cool option to vibrate as well, which I like. I’m rocking out to the much richer sound. Listening: new from former Oasis singer-songwriter Liam Gallagher, whose Lennon-like brilliance is tempered by bizarre behavior that should make him a top pick in the rock dead pool. I’m also enjoying the immensely talented Sia, who is suddenly a global superstar at 41 (you’ve surely heard her stunning tropical house hit “Cheap Thrills” or “Chandelier”) after writing songs for other stars and battling personal demons. The healthcare relevance of the folks HIMSS chooses for keynote speakers often puzzles me and Magic Johnson is no exception. His accomplishments, as far as I can tell, were (a) surviving HIV when most other patients didn’t, and (b) getting rich off basketball and the business deals he struck after he retired (I’ll skip his awful 1998 TV talk show, whose low quality and alarmingly short tenure was eclipsed only by the pitiful late-night efforts of Chevy Chase and Pat Sajak). At least he has directed some of his attention toward social causes and that alone will probably make his speech interesting. He’s on the agenda for Friday of HIMSS week, with the absence of most of us dearly departed attendees providing an intimate setting for those stalwarts can never get too much time at conferences or in my least-favorite city. Thanks to HIStalk sponsors EClinicalWorks and ZappRX for upgrading their Gold sponsorship to Platinum. Thanks to Nuance, which apparently dropped their long-held HIStalk Founder sponsorship by mistake and have reconnected as Platinum since their original spot had already been snapped up by the time they realized it. August 17 (Thursday) 2:00 ET. “Repeal and Replace McKesson’s EIS.” Sponsored by HIStalk. Presenters: Frank Poggio, CEO, The Kelzon Group; Vince Ciotti, principal, HIS Professionals. The brutally honest and cynically funny Frank and Vince will analyze the Allscripts acquisition of McKesson’s EIS business. They will predict what it means for EIS’s 500+ customers, review what other vendors those customers might consider, describe lessons learned from previous industry acquisitions, and predict how the acquisition will affect the overall health IT market. Their 2014 webinar on Cerner’s acquisition of Siemens Health Services has generated over 8,000 YouTube views. 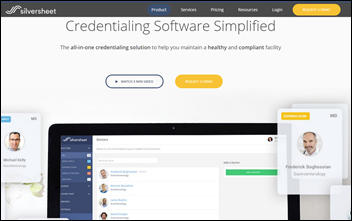 Credentialing technology vendor Silversheet raises $5 million in Series A funding, increasing its total to $10 million. I interviewed CEO Miles Beckett, MD just over a year ago since I was fascinated that he created the “lonelygirl15” web series that ruled YouTube in 2006-2008. A Goldman Sachs report says Amazon’s initial healthcare ambitions may involve partnering with a pharmacy benefits manager to optimize prescription ordering and delivery. The report also speculates that Amazon could provide patient monitoring and telemedicine visits via its Echo that would then allow patients to order the drugs prescribed. It also says Amazon could be interested in using the patient data it collects to cross-sell products, which wouldn’t be the day’s best privacy news. 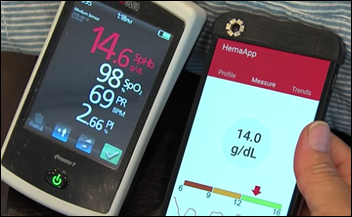 Google buys Seattle-based Senosis Health, which was developing apps that use smartphone sensors for diagnosing newborn jaundice, reduced lung function, and low hemoglobin levels. Those apps have yet to earn FDA’s marketing clearance. 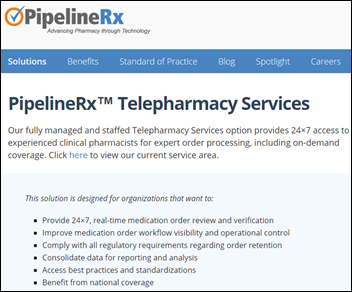 Medication management technology vendor Swisslog Healthcare makes an unspecified investment in managed telepharmacy solutions vendor PipelineRx. Personalized health behavior change technology vendor Happify Health raises $9 million in funding. 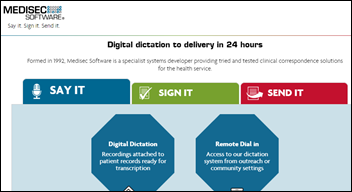 Dublin, Ireland-based Clanwilliam Group makes its 13th medical technology acquisition in three years in buying digital dictation vendor Medisec Software, which is a supplier to NHS. CHOP spinoff Haystack Informatics closes an additional funding round to expand the rollout of its privacy solution, which analyzes EHR activity logs to identity potentially inappropriate user activity. 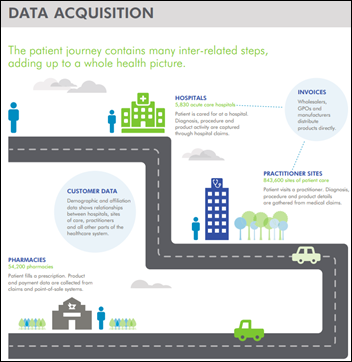 Clinical research organization PRA Health Sciences will pay $520 million to acquire Symphony Health Solutions, which resells prescription data of 280 million US citizens to drug companies who use the information to market their products to doctors. 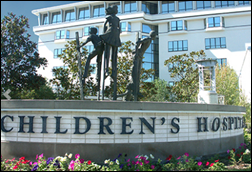 Children’s Hospital New Orleans (LA) selects Vocera’s smartphone app for secure text messaging and hands-free communication. Saint Luke’s Health System (MO) will expand its FormFast implementation in rolling out the company’s electronic signature product. In England, Bolton NHS Foundation Trust chooses Allscripts Sunrise. MIT’s student and faculty ambulatory care center chooses Cerner Millennium and HealtheIntent. Libby Curtis Webb (Copatient) joins ZappRX as SVP of product. 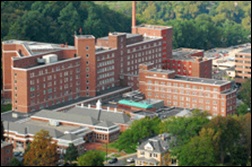 Children’s Hospital of Philadelphia (PA) will run an NIH-funded project to mine big data to look for causes of pediatric cancer and birth defects, with partner organizations running several data portal, genomics standards, and analytics sub-projects that will combine clinical and genetic sequence data from several cohorts into a centralized database. 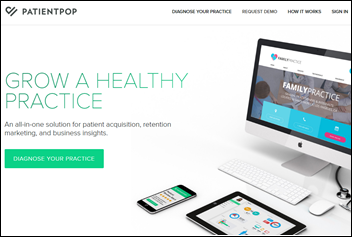 PatientPop – which offers practice-building tools – adds the ability for Google searchers to schedule an appointment directly from the practice’s Google My Business listing that shows up to the right of the search results. 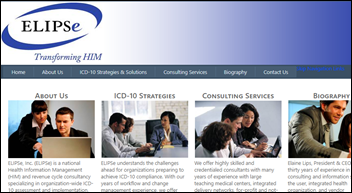 Navient subsidiary Xtend Healthcare buys HIM and revenue cycle consulting firm Elipse. A technology paper profiles Phynd, with founder and CEO Tom White explaining its provider data management solution. 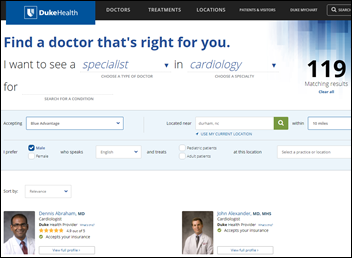 The company’s Phynd a Doc consumer search function is used on Duke Health’s website (above). The Tennessee Hospital Association and Audacious Inquiry launch ConnecTN, which will share real-time ED visits and hospital admissions among THA’s hospital members and TennCare. Apple is reportedly talking to Aetna about making the Apple Watch available for free or at a discount to the insurer’s customers, which would extend the program beyond Aetna’s wellness program that covers its 50,000 employees. Optimum Healthcare IT opens a managed services office in Duluth, MN and is profiled in the local paper. OpenEMR enhances its open source EMR to operate as an out-of-the-box cloud services solution using Amazon Web Services, providing benefits that include automatic scaling of computational resources for cost effectiveness, cutting edge network security, zero hardware maintenance, easy software deployment, and robust backup and recovery solutions. The Department of Justice demands that web hosting company DreamHost turn over the personal information of 1.3 million visitors to an anti-Trump website, ordering the company to provide IP address, contact information, photos, and emails. 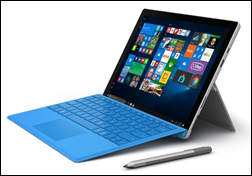 Microsoft defensively downplayed a Consumer Reports estimate from last week that 25 percent of its Surface tablets and laptops experienced problems – which caused CR to withdraw its “recommended” rating – but internal Microsoft documents suggest that Microsoft was fully aware that the Surface Pro 4 and Surface Book have high customer return rates. Here’s some easily-remembered advice: never buy hardware from Microsoft other than keyboards, mice, joysticks, and Xbox components. The rest of their lineup is stuff other companies sell better and cheaper (unless you still believe the Zune was a great digital media player and subscription music service). 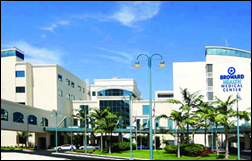 The HR SVP and an interim hospital CEO of Broward Health (FL) quit following the resignation of an SVP who had been accused of overpaying a politically connected marketing company by $1.7 million in a secret side agreement. The health system’s then-CEO committed suicide 18 months ago, after which the board ignored the candidates presented by its search firm and instead gave a fellow board member the $650,000 job. That CEO is a nurse whose only graduate degree was issued by a notorious diploma mill that has since closed. I hadn’t seen this: Physicians Healthsource sues Allscripts under the Telephone Consumer Protection Act for sending junk advertising faxes without opt-out instructions. The plaintiff claims it received 36 faxes from 2008 through 2011 and seeks class action status. The judge labeled Physicians Healthsource as a “professional class-action plaintiff” that has filed several similar “junk fax” class action lawsuits using he same law firm and notes that fax machines have mostly been replaced by computer software, meaning that recipients expend little money or time in discarding unwanted faxes even though federal law still allows filing such lawsuits. The judge also noted that Allscripts had previously been sued by a physician’s office for the same issue and paid $600,000 in legal fees plus whatever settlement they agreed to, concluding that Allscripts “should adjust its marketing strategy a bit, or at the very least, stop sending faxes to what might be one of the more litigious businesses, in terms of junk fax litigation, in the country.” The court also notes that the maximum penalty for junk faxing is $500, but such class action lawsuits can create a windfall for the law firm as both sides pay expensive attorneys to argue over the small sum. The judge’s comments are entertaining and cynical, showing obvious disdain in the ruling above for a Congress-created law that he clearly thinks is ridiculous. 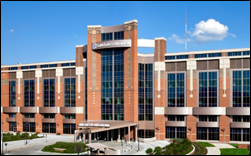 UnityPoint Health (IA) is optimizing its EHR build by using LogicStream Health’s Clinical Process Improvement solutions to review sepsis screenings and to compare protocol usage to evidence-based best practices in real time. EClinicalWorks supports National Health Center Week and the 700 Community Health Centers that use its systems. The company was also named as a Frost & Sullivan customer value leadership award winner for its RCM services. Kyruus will integrate its ProviderMatch for Consumers with Binary Fountain’s online patient reviews to enhance its online search directory pages. Besler Consulting will present at the HFS Provider User Meeting August 18 in New Orleans. Gartner includes Dimensional Insight and its analytics applications in three healthcare research reports in July 2017. IDC Health Insights includes Medecision in its HealthTech Rankings Top 50. Glytec CMO Andrew Rhinehart, MD discusses Glytec’s contributions to value-based reform. Ingenious Med will exhibit at the HFMA NC Summer Institute August 23-26 in Myrtle Beach, SC. InterSystems will exhibit at the Sunquest User Group meeting August 21-24 in Tucson, AZ. Have you ever solicited reader input on who you’d actually be interested to see as a HIMSS speaker? Maybe someone at HIMSS is a reader and would take note. I too don’t have much interest in Magic. I’ve asked before, but there’s the obvious dichotomy of who attendees say they want to see vs. who they will actually turn out for. I’ve run polls before and everybody says they want to see patient advocates and less-famous people, yet it’s the celebrities and politicians that fill the room (Dana Carvey and Dennis Quaid being a couple of irrelevant lightweights who still drew star-struck crowds). I think HIMSS is right on this one even though I wish it weren’t the case — Magic Johnson will be as much a draw as anyone could be for a Friday session. Becker’s had boxer Sugar Ray Leonard as a keynoter, so obviously they were just trying to add a celebrity air to their event instead of staying on topic and HIMSS does the same. Maybe Magic will be irrelevantly inspirational. … to listen to a guy who’s claim to fame is sexually exploiting hundreds or thousands of women (self attestation) and came down with HIV, as part of HIMSS. Steve (and now Hal) – not so cool. Aren’t there some options that qualify as an actual role model? Kid Rock maybe? Paul Stanley? While I think that 500+ bed hospitals are a good indicator, I don’t think it is the most meaningful. I would like to see another stat, that I think would be more telling, is the IDN’s and what their preferred vendor’s are as well as their total footprints. Those are, in my opinion, the most telling stats since they are the organizations that are really in acquisition mode. Community Health Systems, Tenet, Ascension, Dignity, Banner, Advocate, Adventist, Iasis, UPMC, UHS, Intermountain, CHI are all Cerner Shops (yes CHI is about a 50/50 split but once they are potentially acquired by Dignity, they will all flip to Cerner). I agree and will ask Blain if HIMSS Analaytics has that data. I think Supine on the Sand was using the 500+ bed hospitals as a proxy for that more comprehensive information, assuming that IDNs carry a lot of system selection influence and there’s usually a huge flagship hospital involved, but you are right that the big regional and national organizations (dare I call them “chains” even when they are non-profit?) have even more influence and a higher ratio of big to small hospitals that might not be reflected in just looking at their huge facilities. That corporate ownership is also driving home the idea of a two-horse race since the big systems never choose anything other than Cerner or Epic, with their only exceptions being acquired facilities that they allow to temporarily keep running whatever system they had before. I think you are seeing that influence, as well as the Cerner and Epic offering of a simpler, hosted system for small facilities, in the small-hospital numbers from HIMSS Analytics. 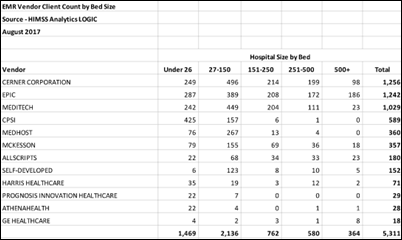 I would not have guessed that both Cerner and Epic are running in more under-26 bed hospitals than Meditech, nor did I appreciate CPSI’s dominance in that bed range. I’m also assuming that “self-developed” is mostly the VA hospitals running VistA. I’m also surprised — although not very — that McKesson’s hospital count isn’t too impressive and that includes legacy products other than just Paragon, which isn’t quite the world-beater that MCK seemed to think. How many hospitals were running Siemens when Cerner bought them out? I can’t remember. But it seems like that would be a factor in how they are tied with Epic in 200 -400 bed range and moved ahead of MEDITECH.